The first purpose of any student's dictionary is to provide the basic information necessary to be able to understand a meaning, decipher a pronunciation, make a correct syllable break, and employ vocabulary appropriate to a particular situation. 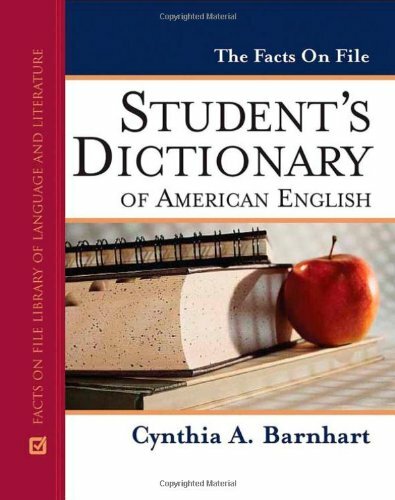 "The Facts On File Student's Dictionary of American English" is designed to provide such information as accurately, concisely, and clearly as possible. Its modest entry list of about 90,000 words includes the vocabulary most of us use every day in ordinary writing and encounter in reading a newspaper, novel, magazine, or online article. The dictionary also includes a selection of widely used new terms in English, from science and technology to contemporary American culture. The design is exceptionally user-friendly. Each entry of the standard vocabulary has been evaluated and revised according to current usage. Unlike other dictionaries - including collegiate - this dictionary features long entries that have been trimmed to their core meanings; shades of meanings are illustrated by phrases or sentences that follow a definition, rather than by different definitions entirely. The result is a reliable, easy-to-use guide to the English language. Last edited by arcadius; 03-31-2017 at 03:53 PM. @usama262000 , reuploaded. Try now. This is wrong place for asking expired links to be reuploaded.